From a positively glowing profile of the saint-like philantropist Ben Cohen in The Times - he has an autobiography out, Carry Me Home. 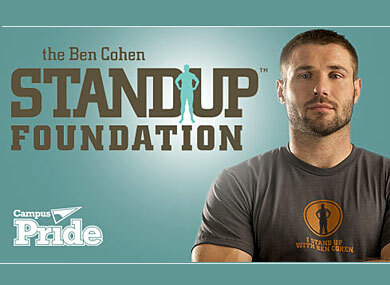 So let's take this opportunity to look at the last accounts of the Ben Cohen StandUp Foundation available to view online. Incoming revenue $335,000 (circa £200,000). Grants given out $108,000 (circa £75,000). Last UK accounts (UK Charity Commission 2012). £107,000 - £7,000 = £100,000 a year. Depending on exchange rates that's about £80,000 in grants from £300,000 raised. He got a $235,000 gift from Nike [p.15] for... taking his pants off in Attitude, one must presume. As ever Fagburn invites the Foundation to comment on these - perhaps I have mis-read them. PS Bad news ladies - there's no Ben Cohen 2016 calender, as the 'rugby hunk' is a bit fat and wobbly at the moment. Well, that would be a bit embarrassing if you've set yourself up as an 'anti-bullying campaigner'. 'Cuddly Ben' has previous for harrassing her mother.